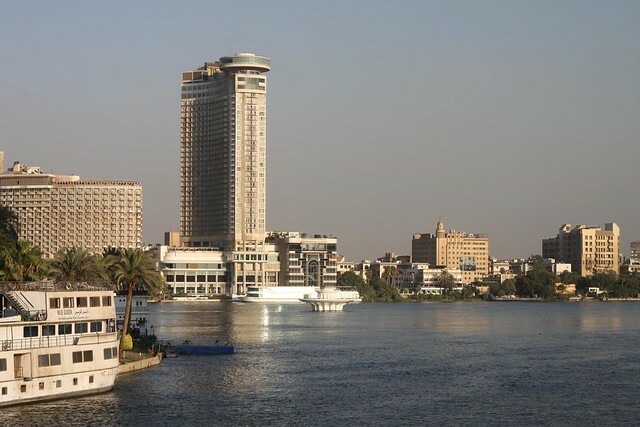 In Cairo I was staying at a small hotel in the city center, an easy 10 minute walk from Tahrir Square where the Arabic Spring started in 2011. Five years have past since I was here on my own bike ride heading towards Asia. 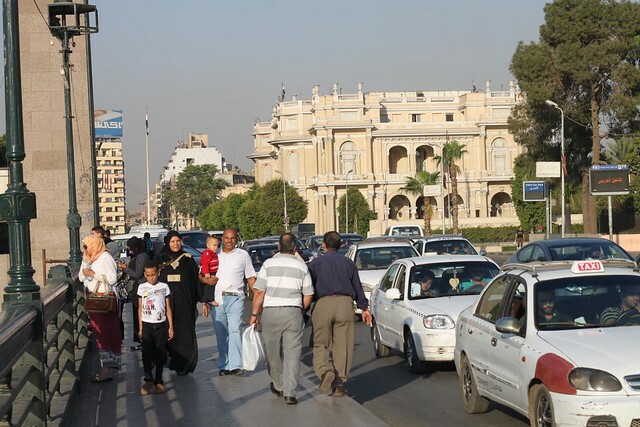 The memories from my last visit kept coming back as I walked around the streets of central Cairo. I’m usually not too fond of cycling around huge, chaotic cities, but for some reason I enjoyed the craziness of biking through Cairo. 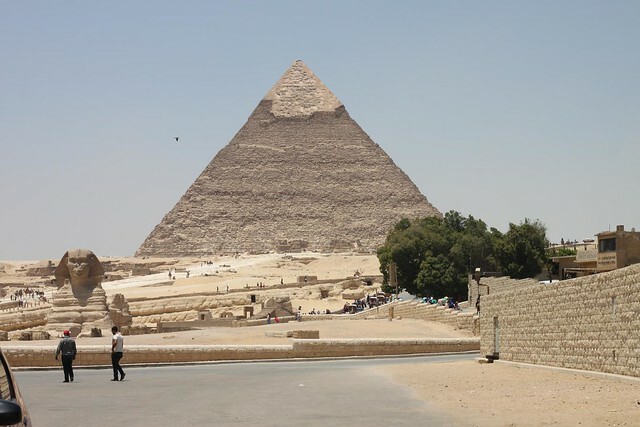 I wanted to go out to the Pyramids of Giza which are located in the western suburbs of the capital. 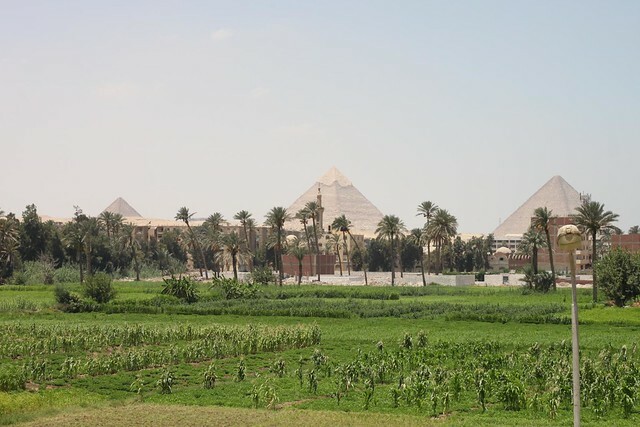 It’s a rather strange feeling to be cycling through a very local neighborhood and suddenly see the Great Pyramid of Giza right there around the corner! 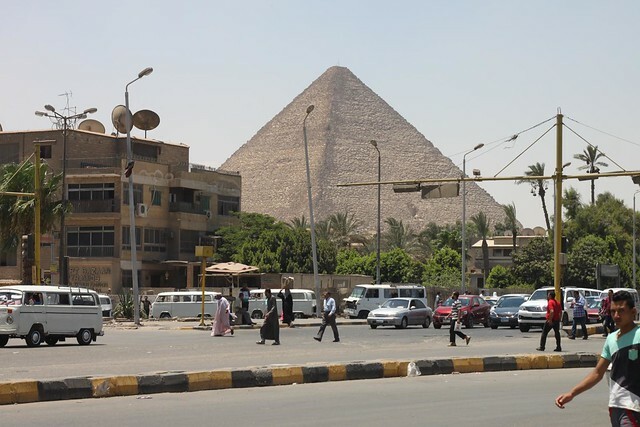 I’m not sure if its the pyramid or the run down suburb that looks the most out of place. 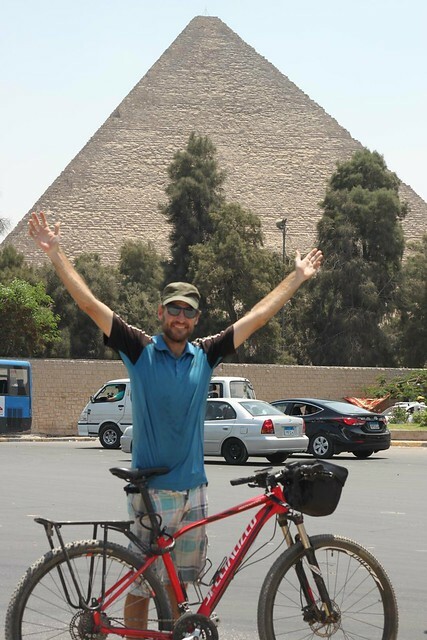 I was trying to get closer to the star attraction of Egypt to take a photo with my bike. That turned out to be difficult since bikes are prohibited inside the area. I did manage a victory photo though. Then I met up with my friend Amir who I got to know when we were both studying in Switzerland some 11 years ago. 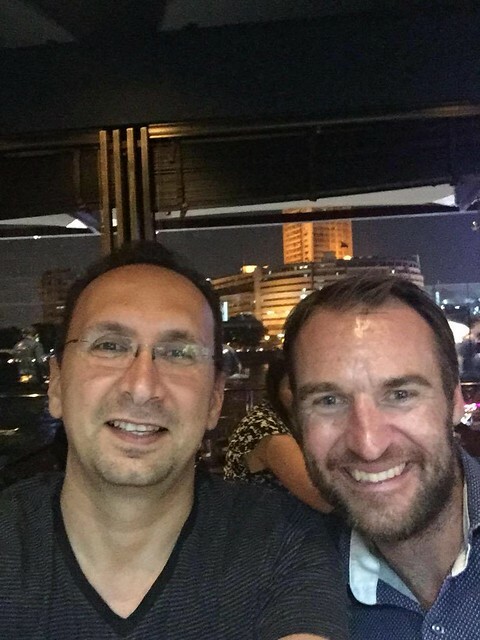 Back then I wouldn’t have guessed that the next time we would see each other would be in Cairo after having cycled 53000 km around the world. 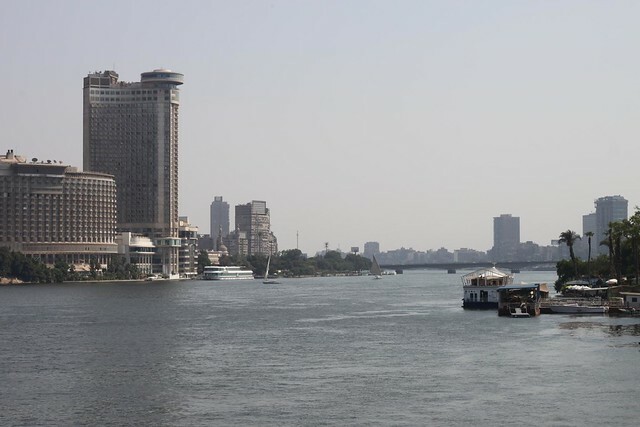 Now we were having a beer and a bite to eat at a fancy restaurant floating on the Nile – followed by yet more beers in a bar that might as well have been located in Europe. For me the evening was a reminder of how many layers a society like Egypt has. I’m used to be spending time in the underdeveloped villages, but Amir and his friends surely live a life that is very different here in the capital. 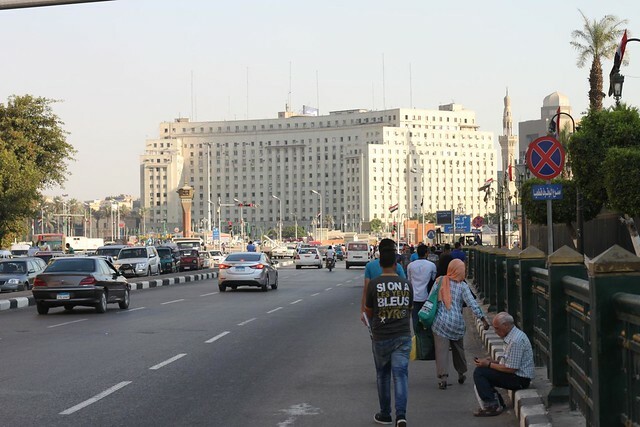 The last day in Cairo I spent walking around the city center looking for a bike box. Even though I have now cycled from Cape Town to Cairo, Africa is not really over yet. I will by flying to Tunisia for a short stop, and then continue to Casablanca in Morocco. From there I will meet up with Manon, a Dutch girl I met in Cali, Colombia a year and a half ago. Together we will cycle up to Tanger and take the ferry over to Spain. That is where Africa will end for real. 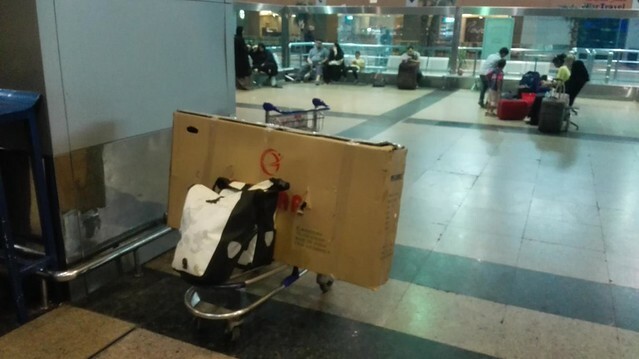 A taxi ride later and I was in Cairo airport, checking in my bike on Tunis Air. 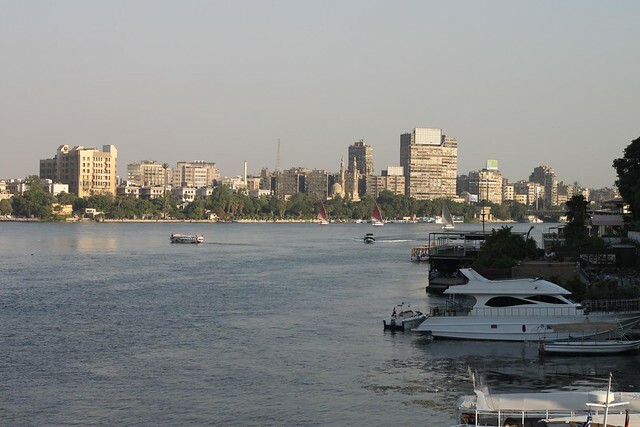 Good bye Egypt, goodbye East Africa and thanks for such in incredible stay. I hope to be back soon. Next stop French speaking North Africa, and then back to my European home soil. A shame to see the (nearly) end of Africa! What an adventure! great video Thomas!! Beautiful world we live in thanks for sharing your adventure with us!!! Thanks a lot Suzanne.. Africa was an amazing experience, and so was the final ride back to Denmark that I will be writing about now 🙂 Merry Christmas from Colombia!